I’ve been getting e-mails and PMs from readers and friends asking me all sorts of questions about our trip: how The Hubby and I got to Buscalan in Kalinga, where we stayed, how much we spent etcetera etcetera. So instead of answering the e-mails/PMs individually, I’m posting this Practical Guide on how to get to Buscalan. I hope this helps those who are planning to visit Whang Od soon. Don’t forget to tell us about your adventure, okay? 1. How did you get to Buscalan from Manila? We went to Buscalan via Tabuk. Victory Liner buses ply the Manila-Tabuk route daily. We took the Manila-Tabuk bus which left the Kamias terminal at around 7:30PM and arrived in Tabuk at around 6AM the next day. We then took a jeep going to Tinglayan, then went down Barangay Bugnay which is the gateway to Buscalan. From there, we could have walked to Buscalan which was about 5 kilometers away. But since we were too tired, we decided to take a habal-habal (motorcycle) to Turning Point and from there, walked to Buscalan the rest of the way. Going back, we decided to pass by Baguio before going back to Manila. We took a bus from Bugnay going to Bontoc. From Bontoc, we took another bus (GL?Lizardo) going to Baguio, and from Baguio, took the 7pm Genesis bus going to Manila. 2. Did you get a guide? How much is the rate for a guide? Initially, we wanted a guide as it was our first time in Buscalan and we didn’t know anyone there. When we were researching the recommended guides, one name always came up: FRANCIS Pa-in. But when Hubby called him, it turned out he was already booked. Luckily, Hubby was able to get in touch with Prof. Vene Rallonza who frequents Buscalan and is quite well-known in the area. She called Francis for us and was able to convince him to accommodate us. When we got to Tinglayan, though, he told us that he needed to meet 8 journalists (who, we later learned, were actually students). He told us to go straight to Bugnay and wait for him there. To make the long story short, instead of waiting for him, we just decided to go to Buscalan on our own as it was getting late. On hindsight, I think it was a stupid move especially since we weren’t familiar with the terrain. As for the rate, Francis was charging us 1,000 pesos a day. Which is a bit steep, if you ask me. I’m guessing it’s because he speaks English well and is a bit of a celebrity having guided many foreign television crews in the past. But if you don’t need an English translator, we suggest that you hire someone from Buscalan. Maybe you can even negotiate the fee. We recommend, Whang Od’s grandson, John. 3. Where did you sleep? How much did you pay for accommodations? If you plan to stay in Buscalan for more than a day, we suggest you stay with a family. Apo Whang Od offers the second floor of her house for homestay. We paid 150 pesos a day per person. There are other families willing to rent out rooms, too. 4. Where did you eat? Your host family will provide food for you. But please, don’t expect much. Life in Buscalan is very simple and so are the meals. If you’re a bit picky, you can bring your own canned goods which you can ask your host to cook for you. 5. Is there electricity and cellphone signal there? Yes, there is electricity but there is no phone signal. 6. Do you really have to bring candies and matches? That’s entirely up to you. Before our trip, several people suggested that we bring candies for the children and matches for the families as pasalubong. But these are not necessary. Although they will definitely appreciate the gesture. 7. How much did your tattoos cost? Traditional tattoos are prized artworks. In the past, when tattoed warriors still roamed Kalinga, a tattoo would cost anywhere between several pieces of heirloom beads to one huge pig. It all depended on the size and intricacy of the design. These days Apo Whang Od assesses her work after each session. A small tattoo, like mine, would cost between 200-400 pesos. An intricate bracelet, like Hubby’s, would cost between 2,000 to 3,000 pesos. I hope this guide helps you in planning your trip. Happy travels! Hi Marj, Glad this helps! Good luck on your trip. 🙂 Stay safe! Unfortunately, I lost John’s number. But Francis’ is online (you can find it everywhere!). Good luck and have fun! As far as I know, there’s no need to get any kind of permit. Good luck! That’s great! Ingat and have fun! Hi, may I know your fb account so that I could send you a message privately? (I hope its okay,) My friend and I are planning to see Whang Od and get tattoo with her. There are so many PinayTraveller I saw from the facebook. Thank you very much and more power! Unfortunately, we won’t be going there anytime soon. 🙁 I do hope you’ll be able to find a companion. Happy travels! I’d love more than anything to go! Hopefully I’ll be able to make the trip before the end of year. Quite nervous because I don’t have anyone to go with. Would you know by any chance any groups / guides that get a bunch of people to go together? Hi! I’m even more excited to travel to Buscalan because this blog. Can you please send me a contact number from that village who can guide us to Whang Od? another question, Is it safe to travel to Buscalan this end of October? I’m kind of nervous travelling with all the rains and landslide stuff during rainy seasons especially travelling to Baguio. This entry is really helpful especially for some first time travelers to Kalinga like me. Thanks a lot and looking forwards for more travel guides from you! I think October is a good time to go. 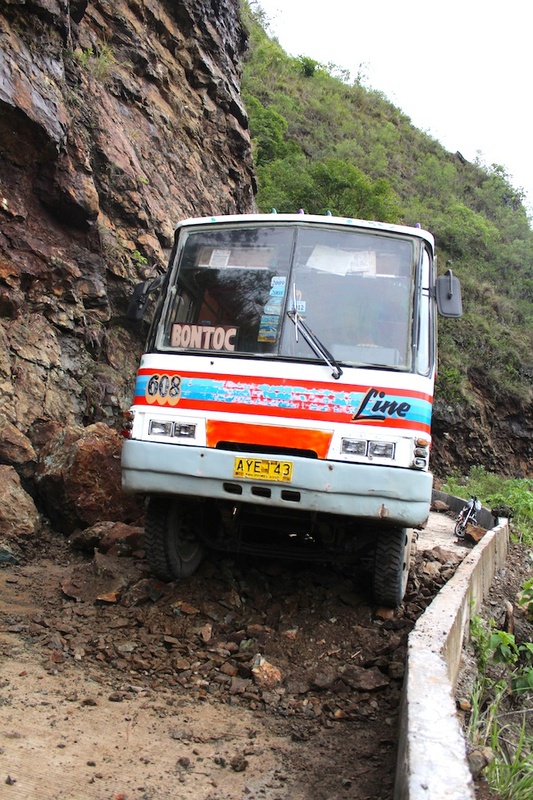 You shouldn’t get into landslide trouble if you use the Tingalan route (as suggested here). As for contacts, unfortunately, we lost the number of John and we really didn’t have a guide going there. I’ll try to look for John’s number again and post it here. I’m glad this entry helped you. Good luck and ingat! This entry is really helpful especially for some first time travelers to Kalinga like me. Thanks a lot and looking forward for more travel guides from you! My cousin and I are going to the Philippines in April, we wanted to get tattooed by Whang-Od. We are coming from Hawaii, but we only speak English and Pangasinan. Could we book you folks? Please get back with me. Thank you. What sort of help do you need. DO you need a guide coming from Manila or just in Buscalan? If you’re coming from Manila, then we can help you (arrange your land travel from Manila to Buscalan, pre-arrange your accommodations etc.) Please email me more details. This is a very accurate instruction for everyone. I can guarantee that this place is beautiful. You’ll definitely learn a lot from their culture and the people. However, I would like future adventurers to be more responsible with their trash. To pick up pieces of trash is not an embarrassing nor a heavy task. Let’s all help mother nature and the people living in the Buscalan by simply collecting the trash the you see, and the trash that you bring along the journey. It’s really annoying to see a beautiful place being disrespected by tourists (local/international). Thank you very much pinaytraveller.com for a wonderful chat, for providing an accurate instruction that is accessible to everyone, and for being the friendliest blog/blogger ever when I was planning to make this trip. More power and God bless everyone! PS: Please bring packs of matchsticks and medicines for common illness instead of candies. Hi Martin! Thank you very much for your comment. I’m glad you were able to go to Buscalan without an incident. I agree with your advice re: trash. Travellers should really be more responsible in disposing their trash, especially in a place as beautiful as Kalinga. Again, I’m glad that I was of help to you. Keep travelling! Hi, We are planning to go to Kalinga sometime soon. What would be the travel time from Tabuk bus dropoff to Tinglayan? Then Bugnay to Buscalan? Though we intend to trek. I’m trying to setup an IT and see if this whole trip can fit into one weekend. Leaving Friday afternoon and come back at Monday dawn. And also trying to determine the availability of transportation once we arrive/leave. Kalinga. I’m not sure if there is a Victory Liner terminal in Tabuk that heads to Manila. So I guess the best route will be towards Bontoc? I also messaged you on Facebook. Thanks! Hi Simon, I hope I was able to answer your questions over at FB. Good luck! Im Nikko, a fellow Filipino Belgian, Im travelling in the country for a month. Ive been reading about kalinga tattoos for a while and have been thinking of coming to the Philippines as well. Your information will serve me well ! Im in Cebu right now but Im planning to visit Buscalan somewhere mid August. Ill have to pass by Manila first anyways, if you have sometime when I get to the capital, Id be happy to meet you guys ! Wow, we’re glad that you find our posts useful! We’d be glad to meet you when you come here to Manila. We’ll bring you to our favorite bar. E-mail us at polmangilog at yahoo dot com 🙂 Or you can also leave a message for me at the PinayTraveller FB page. The travel alone will take up so much of your time. I suggest you set aside 3 days for your trip. Please send me an e-mail so we can assess your needs before we set a fee. hi! I have a neice from vegas who is very interested to explore buscalan and i was thinking it would be cool if you are her tour guide.. i am from cebu city and i am not familiar with the places in luzon but my niece wants this trip so much. The trip is gonna be tentatively this december. Most probably 1st or 2nd week of december. Are you guys free? Hi Paula. We’re trying to organize a tour in October. But if we can put together a group of at least 5, then maybe we can go in December, too. 🙂 Please PM me on my FB page. Thanks! first of all, your blog is grand! My deepest respect. I have to do the trip to Buscalan! I am struggling a bit with the bus ticket. Did you buy it in advance or you just went to the terminal? It is quite far away from Makati, where I stay and I don´t want to spend that much time and money for a taxi only to buy the ticket and on the next day go there again… any advices? Reply as soon as possible for you would be lovely!!! Thank you very much and keep on traveling! Do u have “john’s ” whang ods grandson contact number? hello po, balak po nameng pumuntsa sa buscalan sa jan.16 or 17, kelangan po namen ng guide, can you help us, we are 5 in our group. hello po, we are 5 in our group and planning to go there on jan.16 or 17, we need guide for the informations of their culture., can you help us..? hello! I sent an inquiry via facebook. Very nice post by the way. Thanks! Hello Pauline! I have thoroughly enjoyed your blog, and have been dreaming of getting the chance to meet Whang Od and get a tattoo. Currently, I’m in South Korea and have a ticket for Manilla this coming Tuesday, July 14th 2015. It must be terribly short notice but is there anyway I could get your help as a guide, or perhaps your expert guidence in getting to Buscalan? Please keep up the magnificant work!! Hi! Husband and I would like to visit apo whang-od and get inked… will you be able to guide us and how much will it cost po? Probably this october po ang plan namin… to celebrate our 5th wedding anniversary. Thank you po. Do you have plan to go back this q4 2015? Oct- nov? Hi there! I have read on the comments that you have grace’s number? I would appreciate if you could send it to me. Thank you for your help! Hi! May i know what’s tour fb page? Papaguide lang po sana papnta kay Whang Ud 🙂 thanks! I read you blog about your trip to Buscalan, Kalinga and I found it really helpful for others. I was so inspired and in fact, my friend and I were planning to come and make a visit there this coming December. We were actually looking forward to meet Whang-Od, and get inked by her. I would just like to ask how much do we need to save for us to have a successful trip there? We are really clueless about this because you know, we’re just college students from Manila. And we badly need to know how we should budget our money on the said plan. And may I also ask if having a tour guide there is highly recommendable? We need to know so that we can manage our budget properly. Thank you Pinay traveller! Please continue to inspire young travellers like us! Please get back with me. Thank you and more power! Me and my husband have been looking for a vacation place for years is our 10 year anniversary in 2017, last sarurday he found ur page. Now we are planning our vacation to Buscalan. We are super excited and have a whole year to plan. We dont know where to start lol but your page i realized is a good place to begin to make this journey happen…. Hello, we are an Italian couple who looking for a guide to kalinga comunity. Are you able to join us for next days? 0916 278 2884 that’s my number if you want to contact me faster. we are leaving Manila tomorrow,are you able to help us as a guide? And this is what I call beneficial content. Maintain the great work. Very good write-up. Seems as though much hard work went into this. Please get in touch with Mr. Johnny Tiggangay 0915 283 7885, tourism officer of Tinglayan, for guide reservation and other questions. Thank you. Hi thanks for the info. im planning to go there alone and spending a night over whang residence. I want to experience this tribal life. Salamat po. Thanks also for visiting PinayTraveller! Did you buy your ticket ahead of time? hi can u pls send me the link on how to get to buscalan? thank you for your post. its very helpful..my emailad..remingtonsteeleph@yahoo.com..thanks..
How to contact francis? The tour guide? This wasn’t the website We were looking for but now I’m glad I found it. I realize it is quite popular on the internet. Good job. Great blog! very informative. :). .. I just want to comment on something, its ok to give food as a gift but if you intend to give medicines it is better to give it to the midwife or the barangay health worker in the area this is to avoid encouraging self medication especially with antibiotics. At least the health workers will be able to provide health information before giving out the medicines. Thanks! A friend of mine, 22 year old girl from CA. got Francis Pa-in. It seems he has a habit of over charging these days (P2000.00) for her only and P2000.00 for 2 pinays that hooked up with my friend in Tinglayan. He was also obssessed with my friend, a pretty American/vietnamese, to the point of being rude, hitting on her and trying to get her to be alone with him. There’s also a rumor about him abusing an american minor. For what it’s worth, judging from my friends account of her ordeal with him, this guy should be exposed for what he can be with young foreign women. Hello I’d like to know how much would it cost for two people for a tourguide. My friend and I will be going to Kalinga this July. Also, are there interested people would like to join us, please reply to this message. Please : Could you help us ? How to come to Buscalan ….from Bontoc ? Schedules of vans or bus in the morning ? Hi! Good day everyone. I’m planning to go to Buscalan, Village by end of October. DIY lang po, baka po pwde aq makisabay. Pls mail me here victor.janoras.avila@gmail.com. Thanks!! how many days can i stay theres? is theres like a kubothat we can rest with? Hello! My name is Amanda and I am eighteen years old. Thank you for sharing your experience and providing insight. Recently, my grandmother passed away. She was my best friend, my role model, and my inspiration. I am who I am because of her. I wanted to get a tattoo for her and, because we are Jewish, I contacted artists in Jerusalem and Berlin who created a beautiful, tribal piece for her. However, I just have the art and need to find an artist. Because this tattoo is so meaningful, and will be very difficult to get emotionally because I still am in the grieving process, and because of the history of my family, I wanted to this right. I would love for Whang Od to be the artist and truly make this experience incredible, but I understand that the pieces she does you choose there. In other words, you can’t bring art for her to do. Is this correct? I was also wondering if you need to write Whang Od a letter or somehow contact her and let her know you are coming? I am planning on being there for at least two weeks most likely towards the end of this summer or next summer. What are your thoughts? Again, thank you for sharing your story. Much love, Amanda. Hello Amanda! these days, Whang Od can only give her 3-dots tattoo because of her eyesight. You better get there soon, though. No need to write a letter but please coordinate with the Kalinga tourism office. Hi could you share the number of your guide?